Following publication of our recent article , we noticed an error in Figure 4. 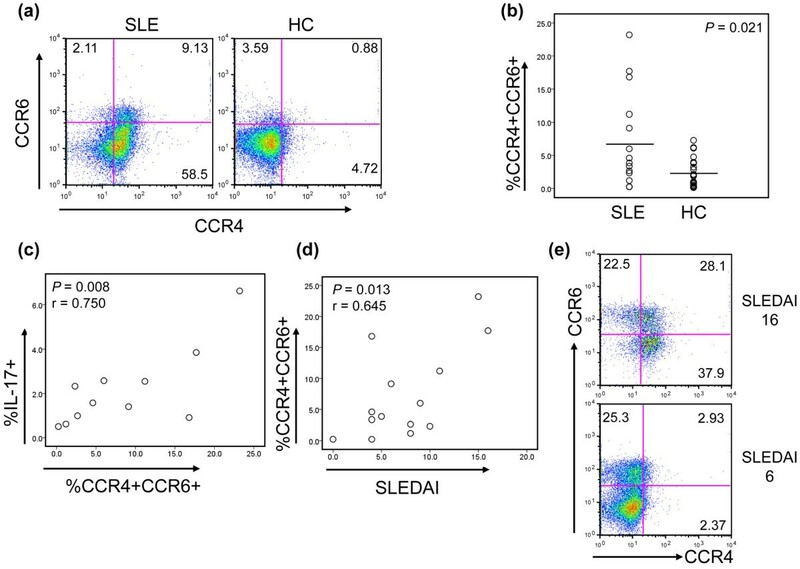 In part (e), the SLEDAI score for the frequency of CD4+ T cells expressing CCR4 and/or CCR6 in a patient with SLE at the times of low disease activities should be "6", rather than "4". The corrected Figure 4 is given here overleaf as Figure 1. Patients with SLE have an increased frequency of CD4 + CCR4 + CCR6 + T cells. The frequency of CCR4+ CCR6+CD4+ T cells in peripheral blood was analyzed in patients with SLE and healthy control subjects by using flow cytometry. (a) Representative dot plots showing CD4+ T cells expressing CCR4 and CCR6. (b) The frequency (%) of CD4+CCR4+CCR6+ T cells in patients with SLE (n = 14) and healthy control subjects (HC, n = 25). (c) Correlation between the frequencies of CD4+IL-17+ T cells and CD4+CCR4+CCR6+ T cells in patients with SLE (n = 11). (d) Correlation between the frequency of CD4+CCR4+CCR6+ T cells and SLEDAI score in patients with SLE (n = 14). (e) Representative dot plots showing the frequency of CD4+ T cells expressing CCR4 and/or CCR6 in patients with SLE at the times of high and low disease activities (SLEDAI score, 16 and 6, respectively). Representative data from three patients with SLE. Numbers in dot plots indicate the frequency of cells for each quadrant. Bars show the means. Joe Craft and Insoo Kang contributed equally to this work.